The book art and artists of Rajasthan gives a colorful interiority to the genius of early traditional artists and their works with reference to the western Indian school of painting which flourished in Rajasthan especially in art centers of Mewar i.e. 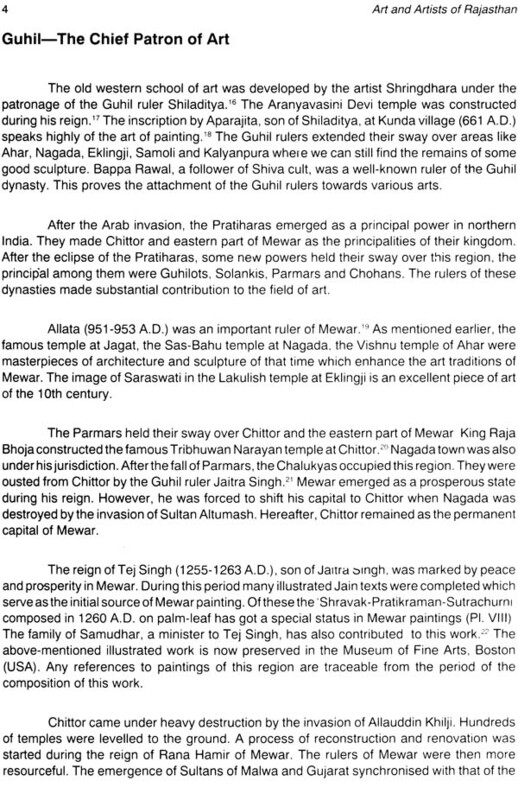 Chittorgarh Dilwara, Ahad, Chawandm Deogarh, Nathdwara and Udaipur. In order to make a more comprehensive study equally useful to art scholars the author tries to produce a substantial understanding of the lives of the artists of mid 19th century and their antecedents up to 7th century. 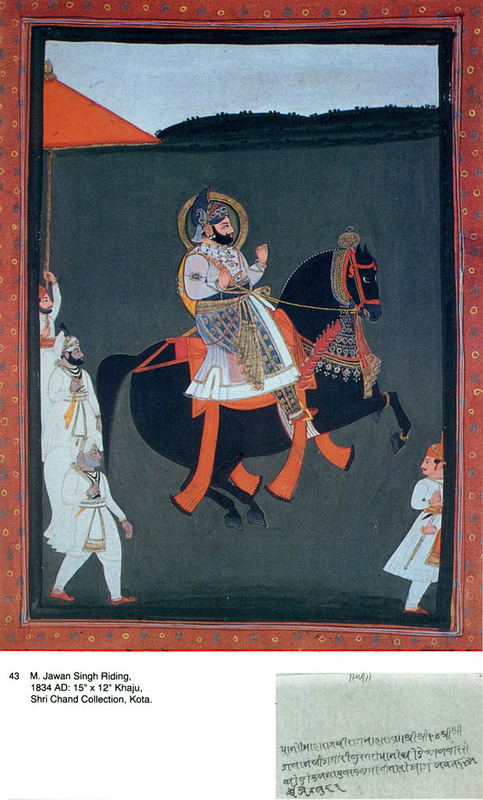 The seventh century of the era with the inception of western Indian school of art is marked for the great and unique tradition of the Indian art in Rajasthan. The book provides a deep insight and highlights the early art works and the artists known through contemporaneous literature inscriptions and colophons of the paintings. The author also throws light on the provenance of chaur Panchashika Bhagavata group of paintings of 16th century and attempts to trace the historiography and the exclusive role played by nearly one hundred so far unknown artists of this region with their artistic execution. 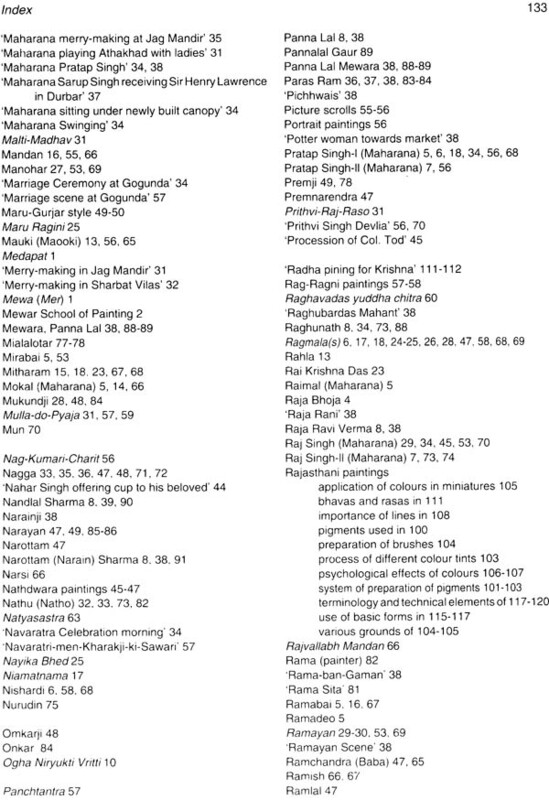 This book also incorporates the findings on indigenous techniques of painting as well as the material which were used by the above artists and the colors prepared by local techniques. In the quest for knowledge the book highlights the cultural heritage rare documents and paintings preserved in private collections as well as different museums and art galleries of the world. Dr. R.K. Vashistha Born at Udaipur (1938) in the family of an artist blends a rare combination of a scholar painter and art educationalist of Rajasthan. He received his first class master’s degree from Rajasthan University in 1966. He was awarded Ph.D. and D. Litt by the University of Agra in 1975 and 1993 respectively. He also completed U.G.C. 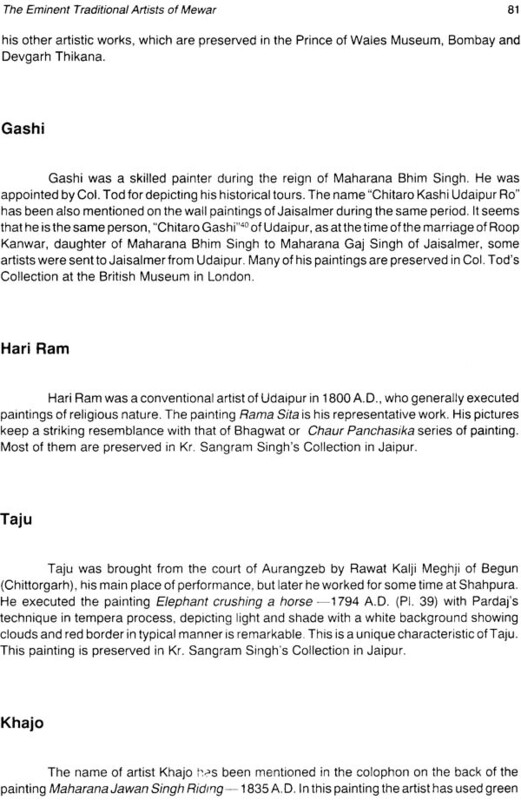 sponsored major research project a study on the inception of modern movement of painting in Rajasthan 1875-1975 A.D. He has recently drawn attention of the art world to the antiquity of art and artists of Rajasthan Hitherto it would not be possible to locate Rajasthan particularly the area of Mewar in the art map of India Dr. Vashistha has mainly concentrated his research work on the art and culture of Rajasthan and has highlighted it with reference to Indian panorama of art history. He has to his credit a number of research papers published in various journals. He has organized and participated in many seminars and conferences. He has widely traveled in connection with his academic pursuits. More than fifteen scholars from within and outside Indian have been awarded Ph.D. degree under his supervision. His book Mewar Ki Chitrankan Parampara released by our late prime minister Mrs. Indira Gandhi depicts the early art tradition of Rajasthan on the foundation of valid documents and original scriptures and this has placed him among the ranks of art historians of our country for this work he was honored by Maharana Mewar foundation award in 1986. His outstanding works of painting are preserved in government institutions and public collections in India and abroad and he has been accorded several distinguished awards in the field of painting. He is presently working as associate professor in the faculty of fine arts university of Rajasthan Jaipur. 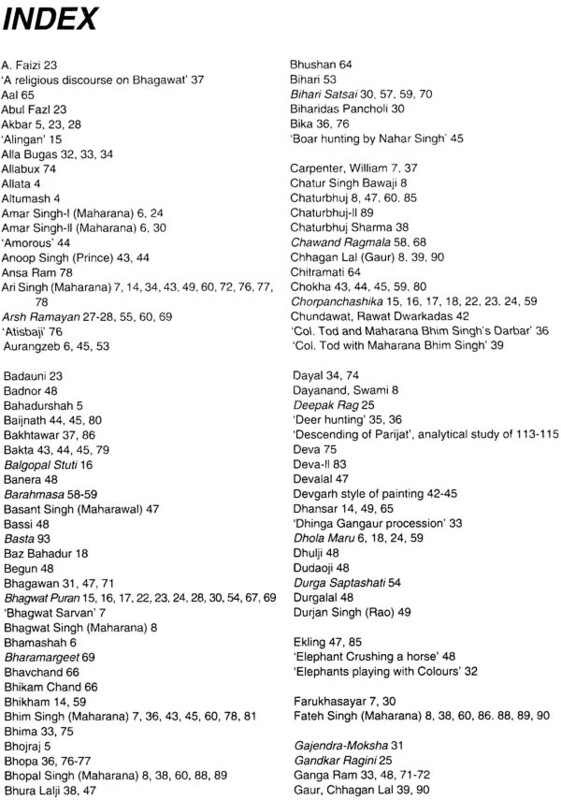 The history of analytical studies of Rajasthan paintings although short is most interesting and varied. A.K. Coomaraswamy was the pioneer who drew attention to the seminal differences between Mughal paintings and Rajasthani paintings by Coomaraswamy many valuable works have appeared. The stalwarts Dr. Moti Chandra and Kari Khandalwala made valuable contributions by identifying new documents bringing to light hitherto unknown material and also identifying salient features of the sub schools of Rajasthani paintings. Understandably the focus of this generation of scholars was on the establishment of chronology and the identification of features which would distinguish one sub school from another. Gradually but surely we have come to recognize not only Rajasthani paintings but the sub schools of Mewar, Bundi, Kota, Kishangarh etc. from amongst these schools Mewar is easily the richest both in materials as also in the quality of craftsmanship and skill. From the last quarter of the 16th to mid 17th century and early 18th century there is a distinct evolution. Sahibdin represents the high watermark of the school in more ways than one. 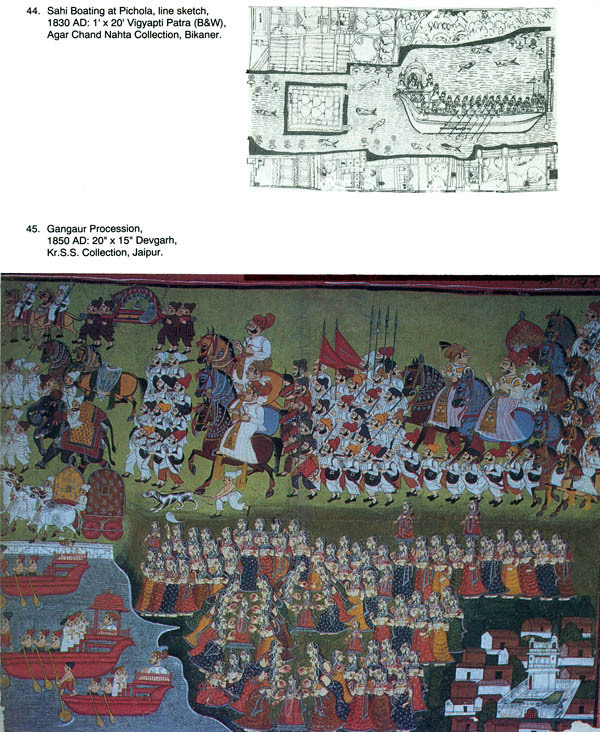 The illustrations of the Srimad Bhagvita in the Gita Govinda of Udaipur Museum and Oriental institute have attracted attention of many scholars. Dr. Vashistha has been able to establish a chronology of the Mewar School and Andrew Topsfield has analyzed in depth the stylistic features. I have tired to relate the verbal and pictorial imagery of the school in the context of my studies of the Gita Govinda. Dr. Vashistha has now opened the doors for a further understanding of the Mewar School of painting by throwing valuable new light on many other distinguished painters of the Mewar School. He has tapped hitherto unknown sources from the records of the Royal palaces. 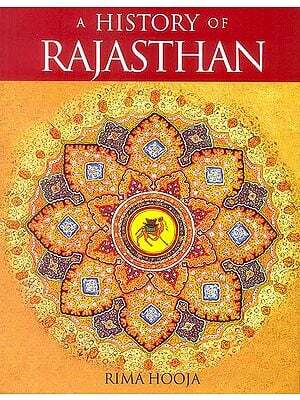 Havelis and has drawn evidence from regional literature and other chronicler sources of Rajasthan. 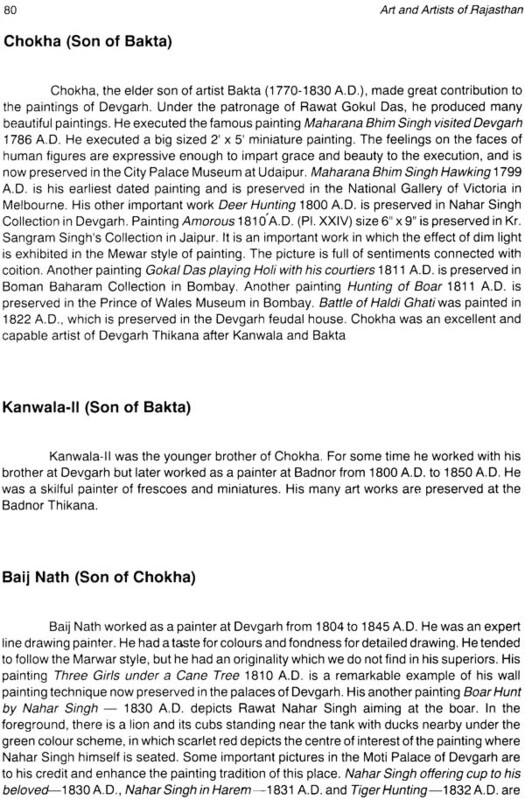 His work is perhaps the first of its kind in the field of identification of painters of the Mewar School (a task accomplished with great dexterity by Dr. B.N. 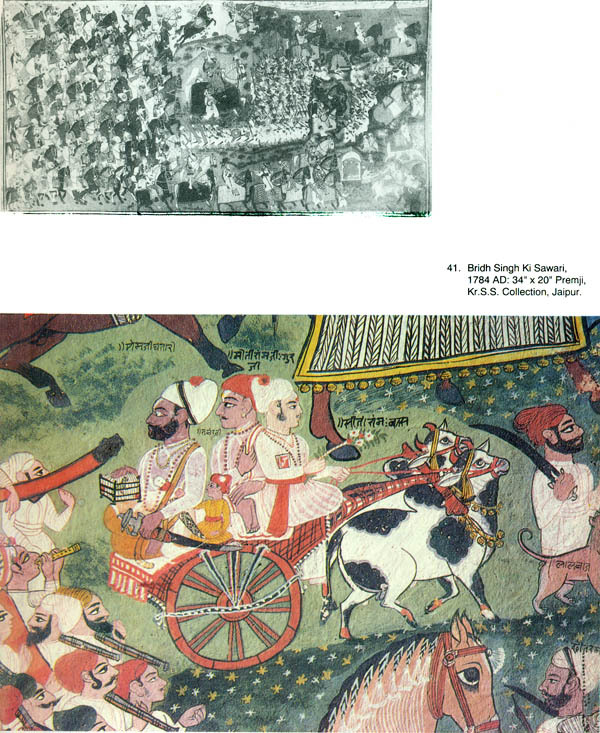 Goswamy and Dr. Ohti in the field of Pahari Miniatures). This is one dimension of the study of Indian miniature paintings which calls for further exploration notwithstanding the fact that in the last essence it is the work of art and not the artist which remains eternal in the Indian artistic tradition. Dr. Vashistha has done well not to enter into the controversy of the tradition of anonymity or individually in Indian art. He ahs only laid bare the field of evidence. 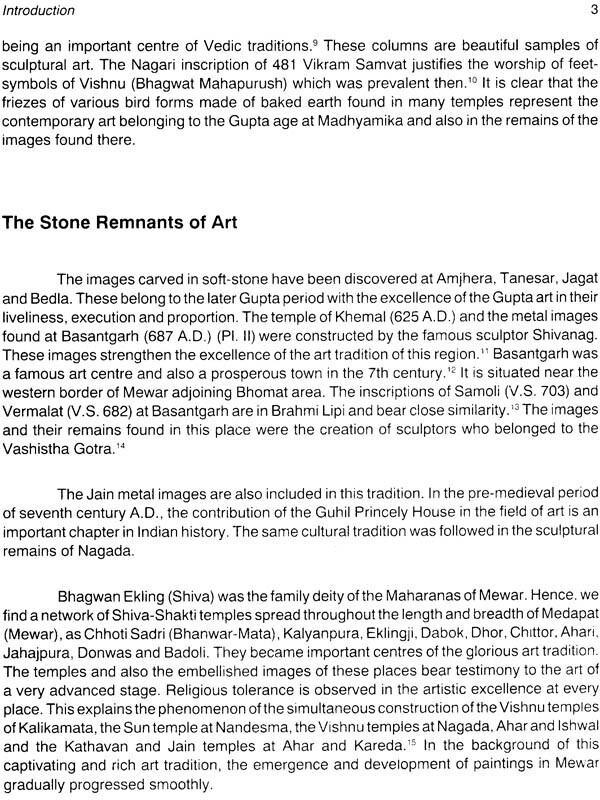 I am sure that this work will enrich our understanding the context of Mewar paintings. 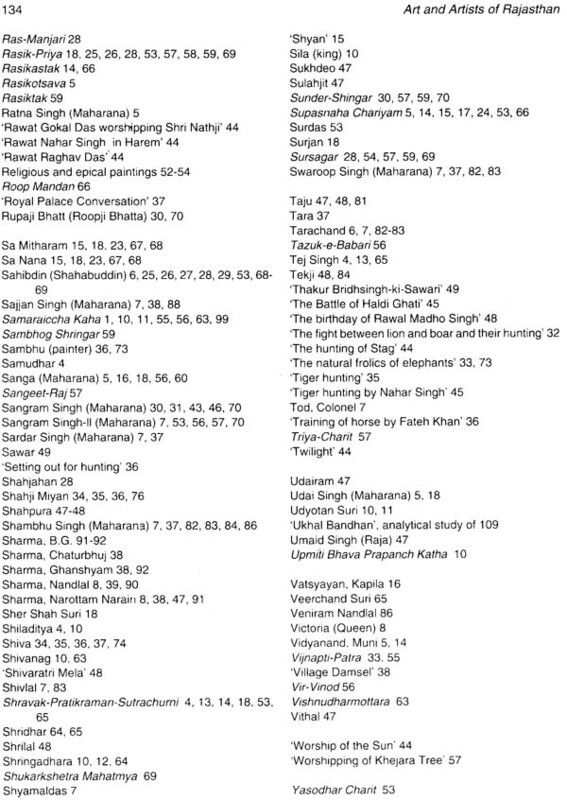 Some nations are reckoned on their art attributes and traditions as Egypt for the earliest monumental sculptures and religions art for the dead Greece for early realism and triumph of the classical traditions Vatican for the enormous wealth of painting and Italy for the glorious Renaissance but the characteristic of Indian art has been a continuous flexible dynamism as accepted by connoisseurs ant art critics. The art of India has been a unique one in the whole of the world not only in leaving legendary impression but also in contributing towards the revival in the form of the contemporary art and its styles. This Indian tradition surviving in different parts of the country later become the epitome of art of the region. 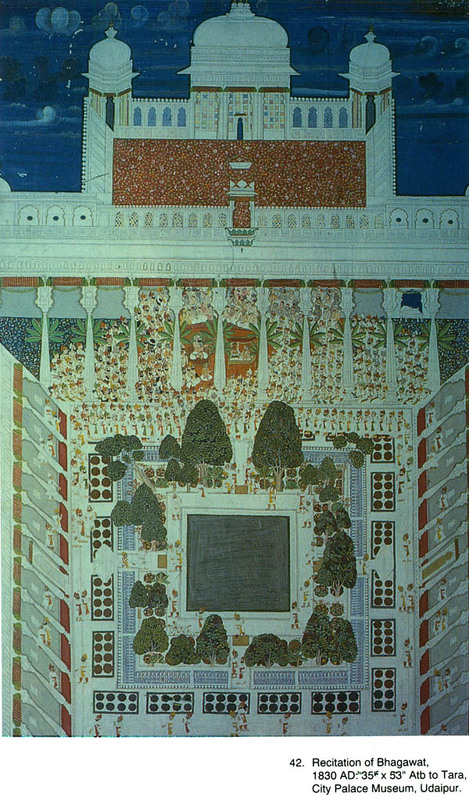 The seventh century of this era with the inception of Western Indian School of art is marked for the great and unique tradition of Indian art in Rajasthan. This trend continued up to 12th century A.D. when the lead was still held by the western Indian School of painting. 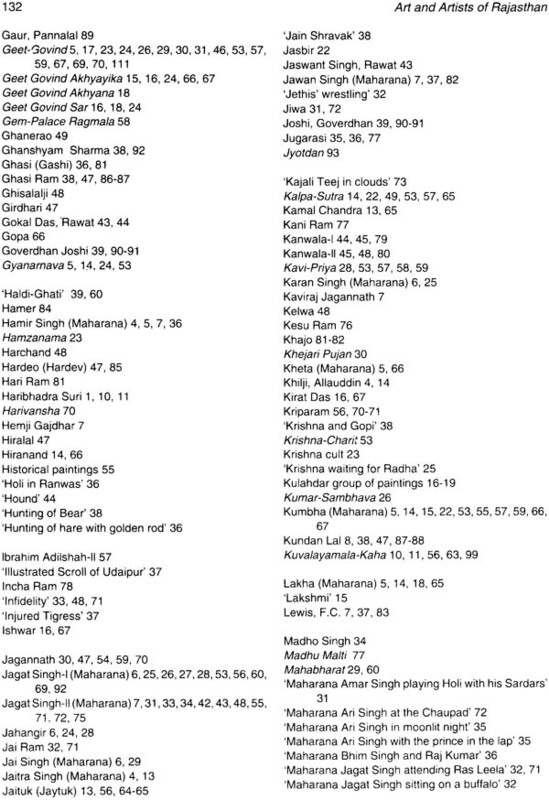 Several names of promising artists have been studied within the sphere of the present work through the various inscriptions and colophons executed in this region. 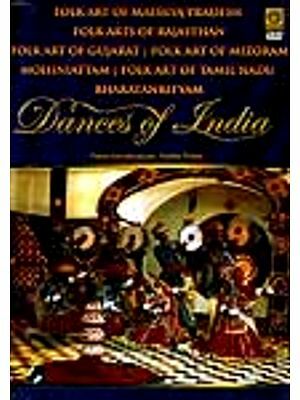 In this book I have also tried to clarity my views about the Chaur Panchashika and Bhagavat Group of Paintings which have been the essence of western Indian style of Paintings and were the climax of the artistic heritage of miniature paintings of Rajasthani in the 16th century. The rulers of Rajasthani although lovers of art and gave patronage to artists did not give importance to studies pertaining to the executors of painting and their characteristics. 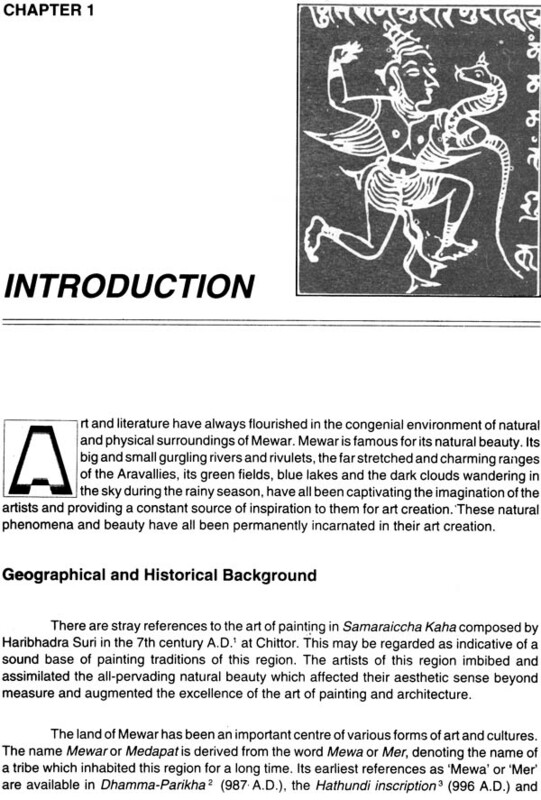 I have tried to study in a more comprehensive manner which would be useful to art scholars the lives of the artists of the mid 19th century and their antecedents up to seventh century of the four regions of Rajasthan – Mewar, Marwar, Dhundar and Harothi – I have attempted to bring out in the first phase the art and artists of Mewar region in all its appeal. I have tried to make this a chronologically arranged source book. I feel pleased to acknowledge my deep sense of gratitude towards late his highness Maharana Bhagwat Singhji of Mewar for patronizing me and I am also grateful to M. Arvind Singhji of Mewar of his encouragement and meticulously nurturing our age old culture through the Maharana Mewar foundation Udaipur. I am also grateful to Dr. Kapila Vatsyayan whose advice and guidance has always been available to me and who has encouraged me to bring out this work in search of a new vision I am equally thankful to Mr. Robert Skelton, Karl J. Kandalawala, Dr. B.N. Goswamy, Dr. L.P. Sihare, Dr. Ratan Parimoo, Dr. S.D. Andhare, Mr. Andrew Topsfield and Dr. Daljeet for giving their consultations and opinions. 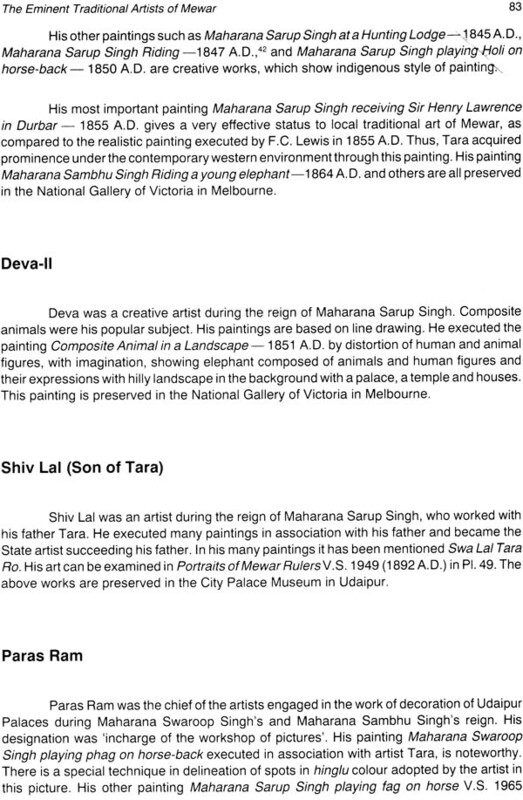 For providing access to reserve collections I am also very thankful to different museums and art galleries such as national museum New Delhi and its director Dr. L.P. Sihare state Museum and Archaeological Department government of Rajasthan as well as city palace Museum, Oriental institute and government museum, Udaipur state Museum, Lucknow prince of wales Museum Bombay national Gallery of Victoria Melbourne V.K. Kanodia collection Patna K.L. Collection Udaipur as well as Kr. 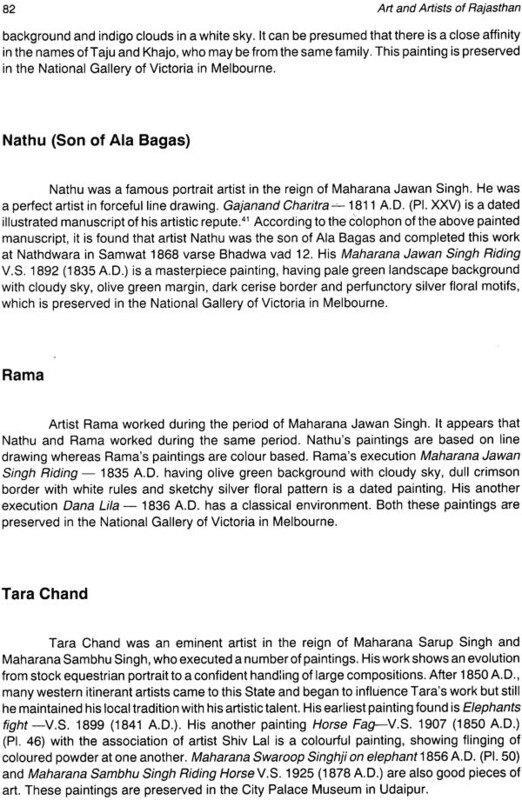 Samgram Singh’s collection Jaipur and other art collectors. It would not be out of place of mention here the name of my promising son Dharam Veer for assisting me in my venture. I do hope that the present work will be an invaluable resource to Indian painting and its distinctive contribution may enrich the genius of artists and art of Rajasthan.